Is Worm Tea Really That Good? Worm tea is the liquid concentrate of worm compost. Minerals and microbial elements are extracted from the solid compost by actively brewing in water by means of an air pump which forces oxygen into the liquid. While a compost extraction can be made by simply stirring, it's made even better if continuous oxygen is incorporated into this "compost broth" which can increase the original numbers of microbes into the billions. This is known as AACT or actively aerated compost tea.In this case, worm tea. 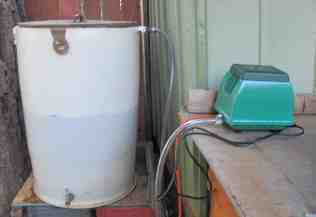 The watery drainage that seeps out of the bottom of a bin is not compost tea as many sites assert. Leaching through yet undigested food waste, this leachate (as it is known) could contain toxic anaerobic microbes that would be harmful to plants. Not only will there be unmineralized organic compounds, but there is the potential for contamination of pathogen organisms and coliform bacteria that can come from some of the raw materials (another reason to always pre-compost fresh manure) put into worm bin systems. The best place for this leachate to go is back in the bin. That way, it gets exposed to the worm's gut to be innoculated with good microbes and is excreted fully sanitized. 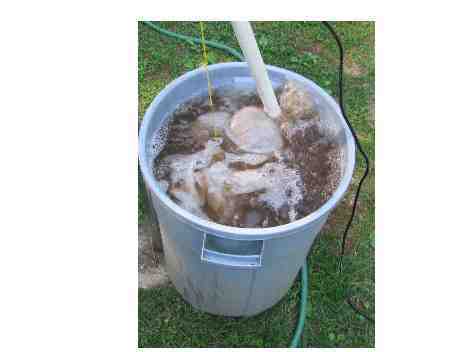 Technically speaking, soaking or steeping compost in a bucket of water is not compost tea. This is termed a liquid compost extract. 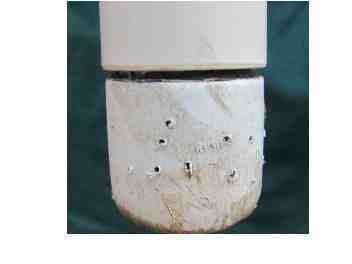 It is beneficial to a certain extent, but you don't get the growth of microbes as in the aerated version. "Our results confirm those of others: so-called anaerobic tea systems—those in which organic stock is simply soaked in water—are actually aerobic for the first 48 hours or so of extraction. 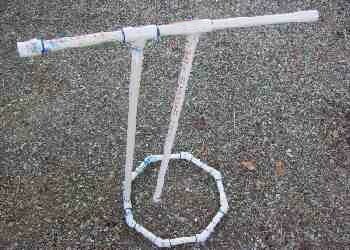 After that, they become anaerobic. In other words, aerated or aerobic systems simply extend the time of useful extraction by replacing or adding oxygen into a system that would otherwise go anaerobic. It should be the goal of all organic tea extraction methods to avoid anaerobic conditions." Using an aerator will give much better worm tea results as it produces a much higher microorganism count due to increased O2. The aerator should run for 12-24 hours. An aquarium bubbler may only provide sufficient oxygen in a 4-5 gallon bucket, but in larger containers the water would be too deep for the bubbler to work adequately. Microbe Organics To provide a food source for the bacteria and fungi, add 1 oz of fish hydrosolate (not emulsion), liquid kelp and 2 tablespoons of unsulphured, blackstrap molasses for every 5 gallons of water. Foam on the tea surface is a good indication of free proteins, amino acids or carbohydrates and the sign of a good aerobically brewed tea. When the brewing time is finished, let it sit for about 30 minutes so any solid matter can settle to the bottom. Filter the solution through a piece of fine netting, window screen or paint filter if you plan to use a sprayer(it has been noted that pantyhose may be too restrictive in not letting some microbes through). This will filter out small particles that could clog a spray nozzle or just remove the spray end and you won't need to filter. A sprinkling can works fine when you don't have to filter the tea. For best results, the worm tea should be used as quickly as possible.. Once the oxygen and food are consumed, anaerobic organisms will begin to take over, producing alcohols and phenols toxic to plants. Keep in mind that microbial growth in the worm tea will be slower to form in the winter than summer. 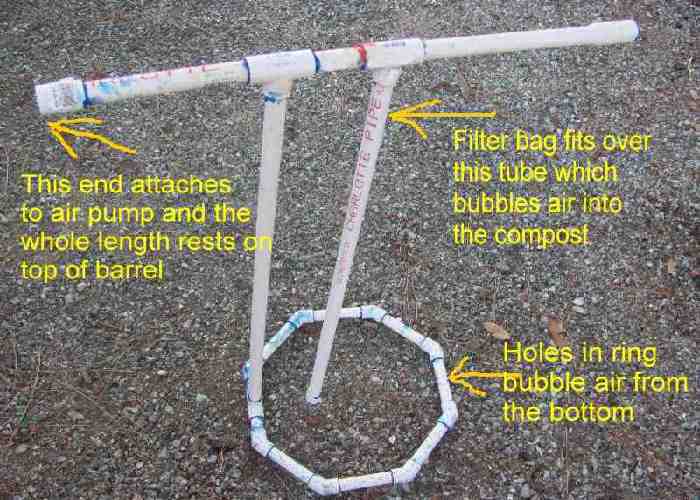 Making this in a shed or garage in the early spring would be advisable where warm water of 70° can be used. In the summer, do not expose to sunlight as UV rays can kill microbes also. Best to use it either in early morning or late in the afternoon. We have upgraded our tea brewing using a 42 gallon drum, a larger outdoor air pump, and a brewer that bubbles from the bottom of the drum. The quality of the worm tea is largely dependent on the quality and variety of feedstock used in the compost. A compost made from mostly paper products will be high in fungi which is beneficial to trees and shrubs. Compost made from manure/food waste will be high in bacteria which is most suitable for perennials,vegetable and flower plants. The finished tea contains a range of mineralized nutrients, such as silica, nickel, selenium, and chromium. Microorganisms from the worm composting process produce chitanase which can function as an insect repellent when worm tea is used as a foliar (leaf surface) application. Some of the microbes contained in various worm composts have also been shown to have disease suppressant qualities and can give some degree of protection to crops from various root and foliar pathogens. The important thing to remember when you are making a worm tea is to only make it from fully processed mature compost. The worms have completely worked the organic matter so that no raw material particles are left. For foliar (leaf) application on most plants (with no pest or disease problems), a dilution rate of up to one part tea to 5 parts of water*. If there are signs of disease or pests, use undiluted until the plant is back in health. For larger acreage, use 5 gallons/acre. For flower, fruit and vegetable crops, 1:5 diluted application(twice per week during rapid growth and fruit expansion) is a recommended rate. For container plants, the tea can be diluted to one part of tea to two parts of water and given once every few weeks depending on plant condition. 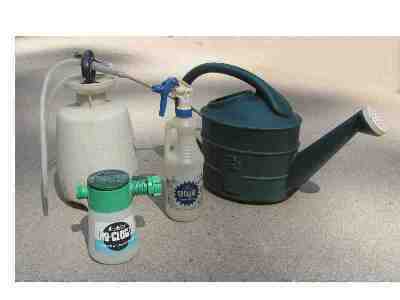 For trees and shrubs, spray undiluted two weeks before bud break and then every 10-14 days at 1:5 part dilution. For seedlings, mist or soak seeds prior to planting. 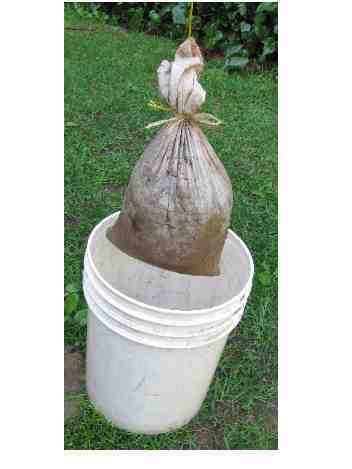 * Always use de-chlorinated water, rainwater, pond or distilled water when making worm compost tea.